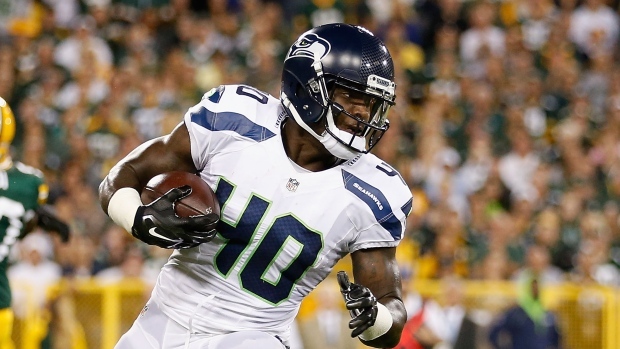 BELLEVUE, Wash. - Police recommended felony charges of vehicular assault and hit-and-run against Seattle Seahawks fullback Derrick Coleman on Monday for an October car crash after which he acknowledged smoking synthetic marijuana. The King County Prosecutor's Office confirmed having received the charging recommendations from the Bellevue Police Department after completion of the investigation. There was no timeline given on when the prosecutor's office may reach a charging decision. According to the police report, Coleman told police he had smoked "Spice" — lumped in as synthetic marijuana — about an hour before the crash. Coleman's truck was travelling at 60 mph in a 35 mph zone and hit a Honda Civic. Coleman's foot remained on the accelerator for several seconds after the initial impact with the Civic, driving it 260 feet down the road until it was pushed off the roadway, up a hill and flipped over, according to the police report. The driver of the Civic suffered a broken collarbone and a head injury. Police said they discovered a lighter, a glass spoon pipe with tarry residue, one open bag of "synthetic cannabinoid" and three unopened bags of "synthetic cannabinoid" in Coleman's truck after the crash. Police said Coleman showed signs of being impaired during field sobriety tests, but blood tests taken several hours after the crash did not show the drug Coleman acknowledged taking. Coleman's attorney, Steve Hayne, said Monday that video he took of Coleman at the jail following the crash showed he was lucid and did not appear impaired. Hayne said the 101-page report released by Bellevue Police was intended to make Coleman look bad, calling it a "manifesto." "Why are they putting all of this stuff in (the report) that is irrelevant and prejudicial?" Hayne said. Prior to the crash, traffic cameras in the area twice captured Coleman driving out of his lane. Witnesses described Coleman as "aggravated" and "incoherent" following the accident and said he fled barefoot despite being told to stay, according to the report. Police discovered Coleman a short distance from the crash and described him as clam and co-operative. Coleman just completed his fourth season with the Seahawks and is a restricted free agent this off-season. He was on the practice squad in 2012 before making the 53-man roster in 2013. Coleman missed 11 games and the playoffs last season because of a broken foot. Coleman is legally deaf and his football success has made him an inspirational figure. He has been featured in TV commercials and wrote a book that was released last year.